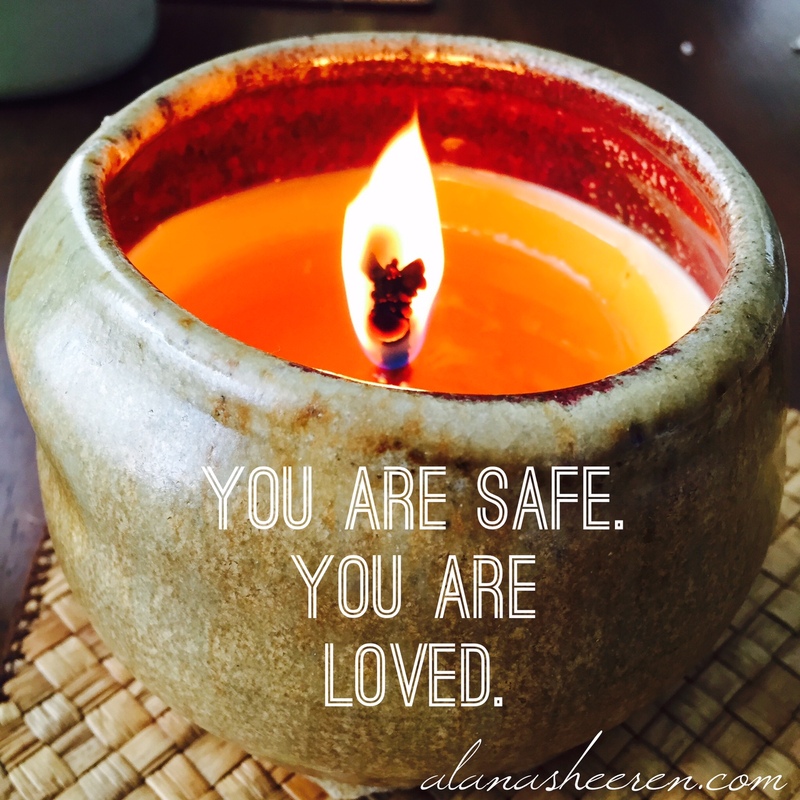 Mantra Monday: I am safe. I am loved. I realize I am privileged to live where I am not in constant physical or emotional danger. This is not true for many people here at home and around the world, and I do not presume to speak to their experiences today. For those of us whose fear stems from reliving the past and being afraid it will repeat itself, or projecting our own dire fantasies into the future, I offer these six words as an antidote. I don’t believe in fearlessness. I do believe in trust, in courage and in the willingness to move through fear while acknowledging its presence. Fear and I are well acquainted. When I learned it was part of my elemental nature* to be constantly dealing with fear, I heaved a sigh of relief. I thought there was something wrong with me, that fear was a place I lived so often. I’ve done a lot to lessen my fear. I don’t watch many movies or read the crime novels I used to love so much. I stopped tuning in to anything that involves violence against women, children or animals (or really, violence of any kind). I don’t spend much time with the news. I’ve learned that 99% of the time I am safe and so are the people I love. I am not free of fear but I no longer feel tormented by it, and I’ve learned I can survive some of my worst fears coming true. Because it’s true and it’s so important to remember. P.S. I often repeat this mantra while sitting with my daughter as she falls asleep, filling the space between us with its energy. You are safe. You are loved. You are safe. You are loved. I want her to know this truth both consciously (from the way her father and I live our lives and deal with our own fears) and deep in her bones. P.P.S. I wrote a very similar post, using the same mantra, last June. If you’d like to read it, you can find it here. I’m chuckling that I didn’t catch it before I hit publish. At least I’m consistent (and the message is still relevant). *I’m referring to the elemental natures of the 9 Star Ki, an ancient system of Chinese astrology based on the five elements of water, wood, fire, earth and metal. This entry was posted in Uncategorized and tagged fear, how to deal with fear, love, mantra, safe, trust. Bookmark the permalink. One Response to Mantra Monday: I am safe. I am loved. Where do we find our Grace?